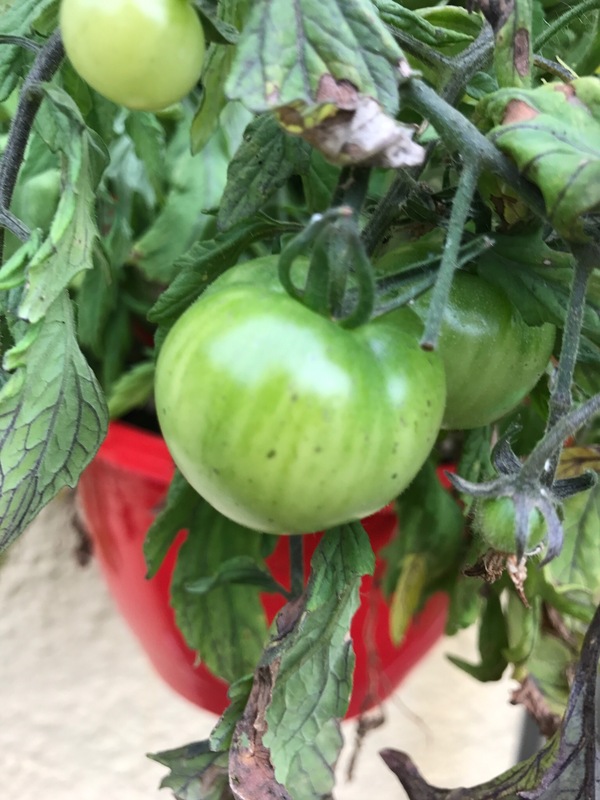 I’ve given my tomatoes a quick feed of Epsom salts and have cut off some of the foliage and am keeping watch. 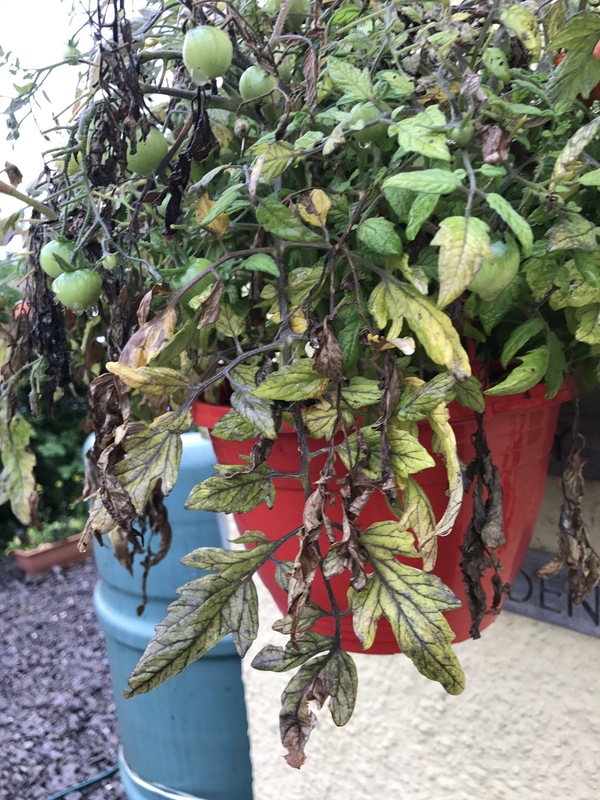 We’ve had a good enough supply of fruit from it so far and the fruit are staying healthy, so I think for us it was a combination of everything (apart from blight). Hopefully we still have plenty more fruit to come. 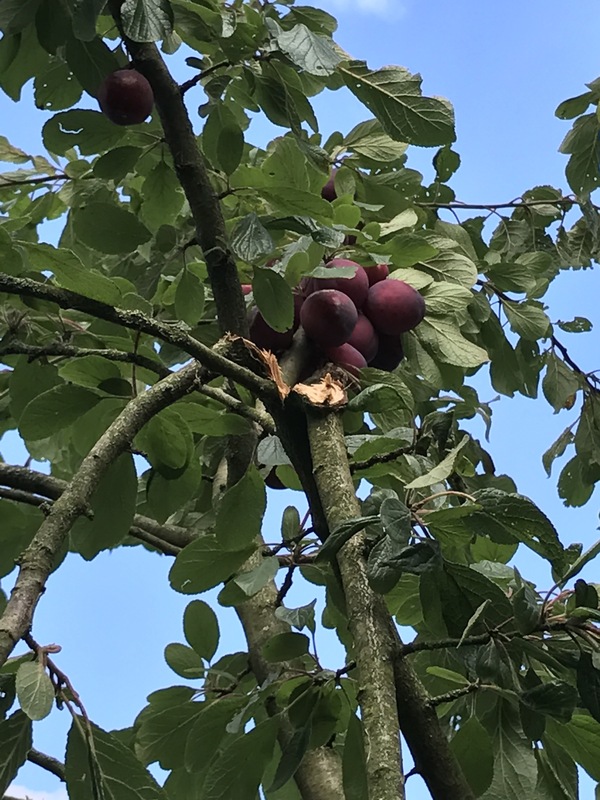 We have one quite old plum tree (well at least we think it’s quite old) in our garden and we’re lucky that it is a Victoria plum tree. 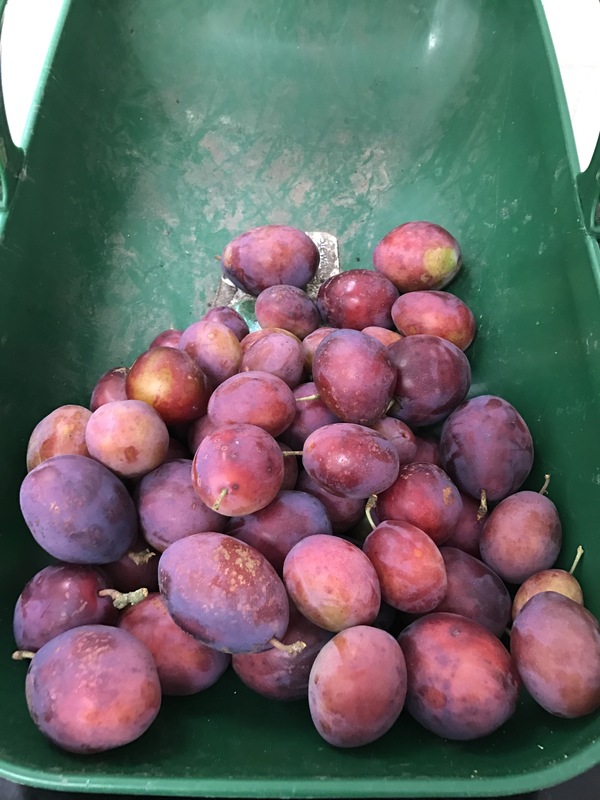 Victoria plums are considered by many as the Queen of plums, their trees reliably produce a good volume of tasty produce. This year it looked like we were going to have an amazing harvest when the fruits started to appear. I had planned to thin them a bit but, what with one thing and another, I never got round to it. It turns out that was a mistake. 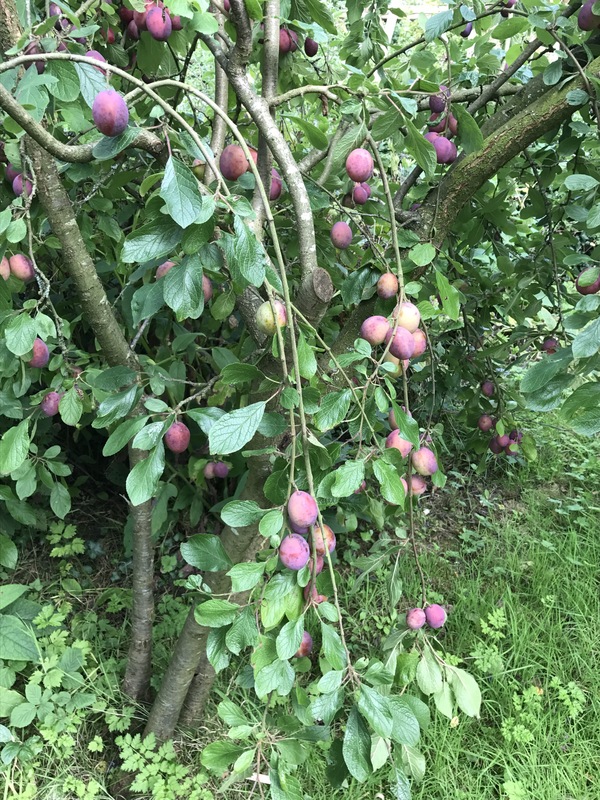 Our tree is laden with ripening plums. However, where we have had so many so close to each other we have had some go bad. And as they are so closely packed the badness spreads quite quickly. We’ve also had a number of branches snap in the poor weather we’ve had and so they need to be tended to. However, it is lovely to see the branches so heavy with fruit, especially as when the hang low it makes them easier to pick! 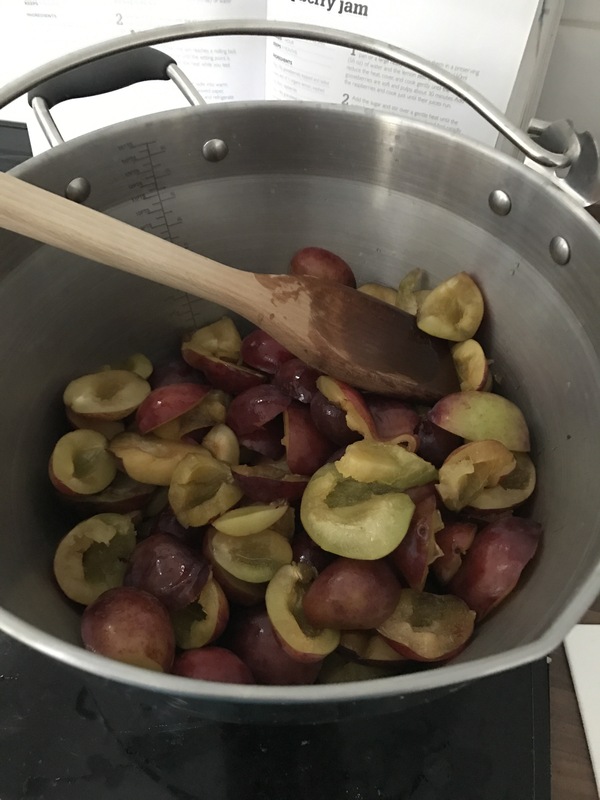 The day before yesterday C and I picked two kilograms and made them into plum and rum jam (a favourite of ours and the one which we get requests for most frequently). All ready to start jam making in my trusty old jam pan. The finished product, 12 jars in total with 3 kg of jam. (I need to get nicer labels, I know, but at least I’m reusing jars). I did have a small amount leftover for us to try on crumpets, I mean it wouldn’t be right not to test it out. So after that massive harvest I thought we would be good for a few days, but then today C and I harvested another 3kg (and we’re still only going for the easy to reach ones. J has requested we make some plum crumble so it looks like that’s going to be this evenings job. I mean granted it was very beautifully formed. I let C pick it (they are her favourite fruit) but even she was disappointed with it’s lack of companions; “I like more blueberries”. Well tough luck for this year I’m afraid. 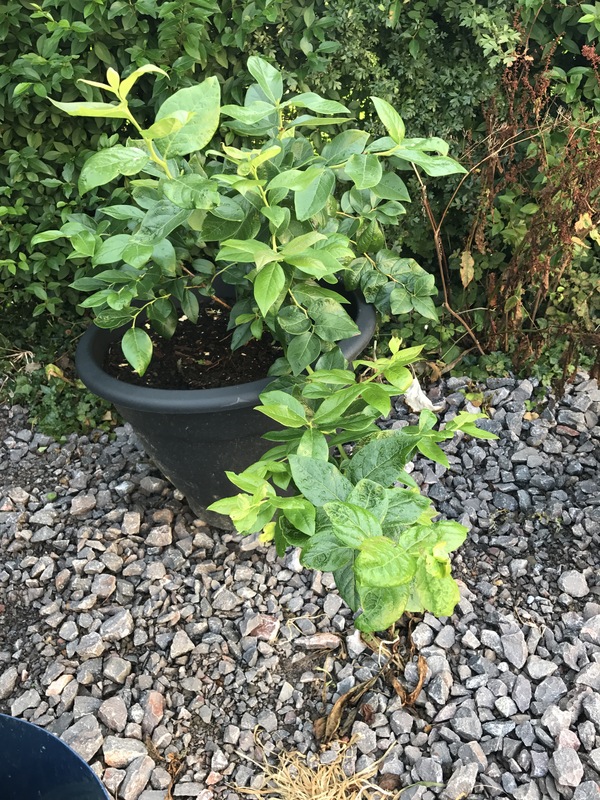 I’m hoping that it is because it’s their first year in proper soil (blueberries need acidic soil) that we have a lack of fruit as the foliage has been really flourishing. We’ve been taking care to water them in rainwater to maintain the PH balance too. I’m not sure what else to do to increase productivity? 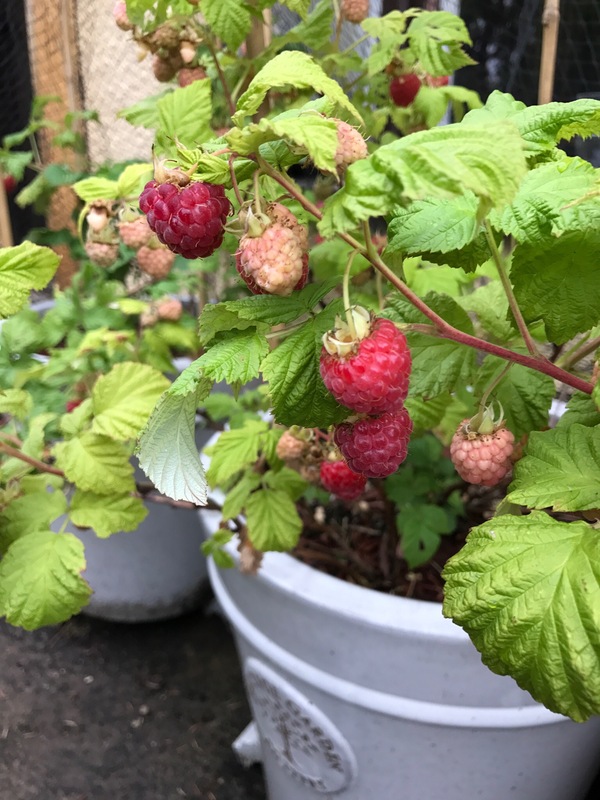 So, this is the second year of our raspberries in pots and their first year fruiting. 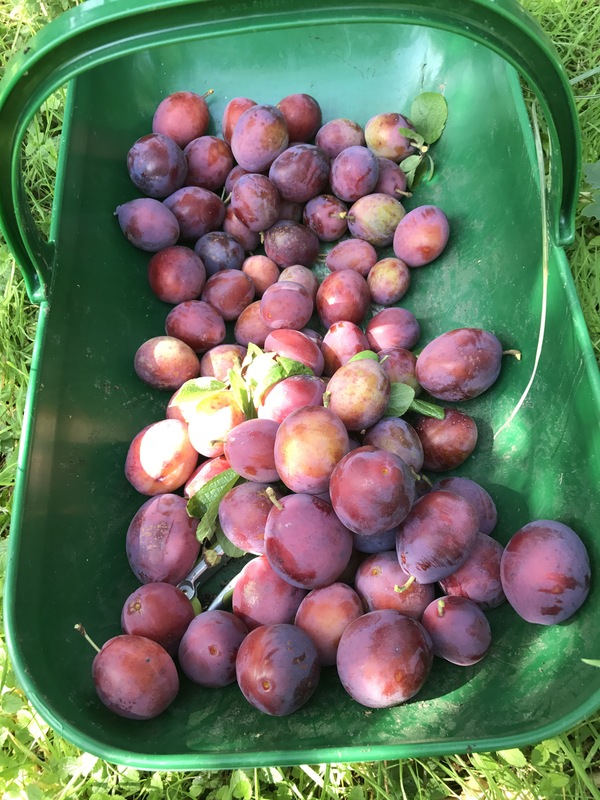 Now I couldn’t remember the variety and whether they were Autumn or Summer fruiting so wasn’t really sure how I was supposed to prune them if at all. 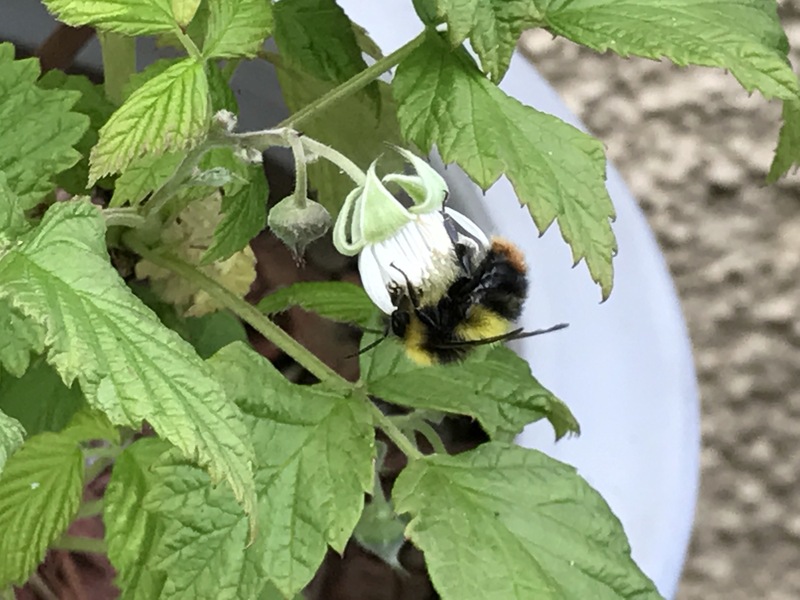 As we’d had a house move and they had been somewhat neglected then I was surprised when the dead looking twigs that were left started to sprout leaves and then produced a good number of flowers and fruit. 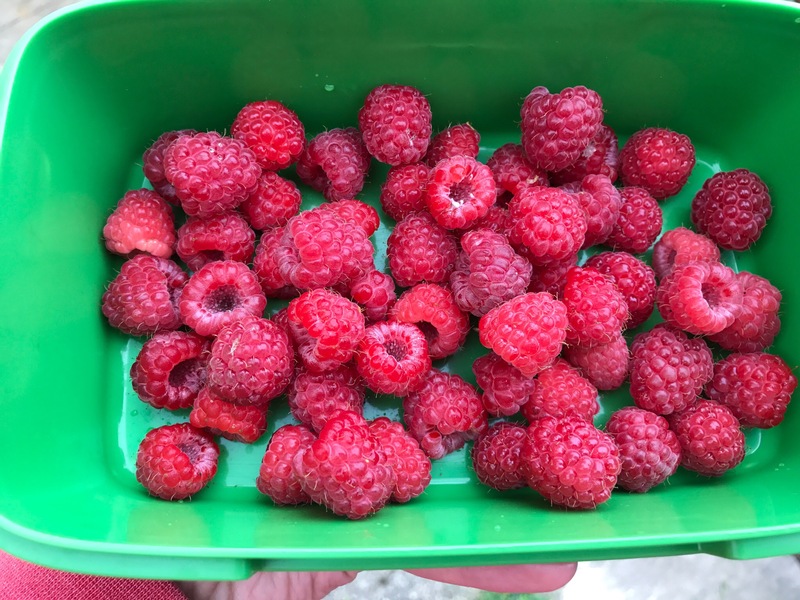 What’s been quite nice about the raspberries is that they don’t all ripen at once so we have been able to enjoy (and still have more to enjoy) fruit for a good number of weeks. Not that I’ve been able to eat or preserve many as I would have liked too as C is a big fan of the pick and eat immediately strategy. She does let myself or J have the odd one but finishes all the rest straight away. Our netting system has worked brilliantly and so far we haven’t lost any of our crop to birds. 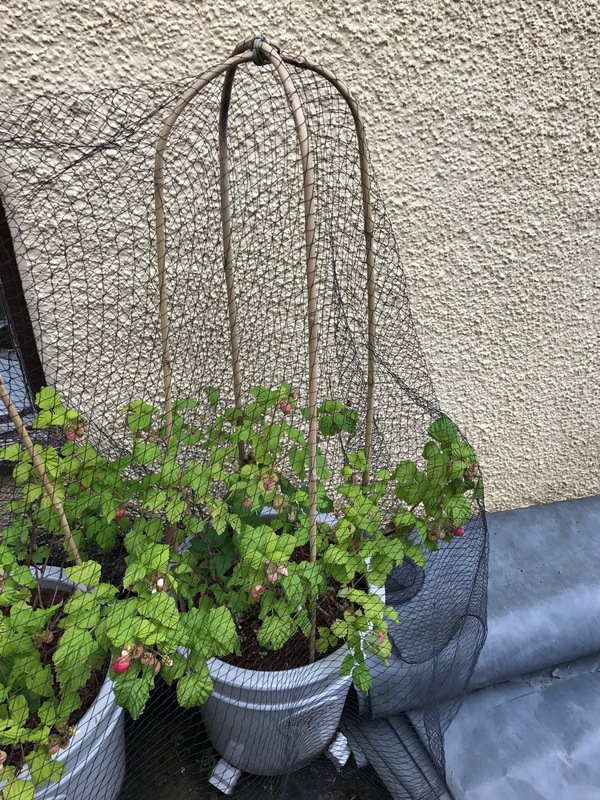 We have some arched canes in each pot tied together at the top and then have just draped the netting over them (see below). Then when we want to pick we simply lift up the netting, pick and replace. Simple yet effective as a system as shown below. 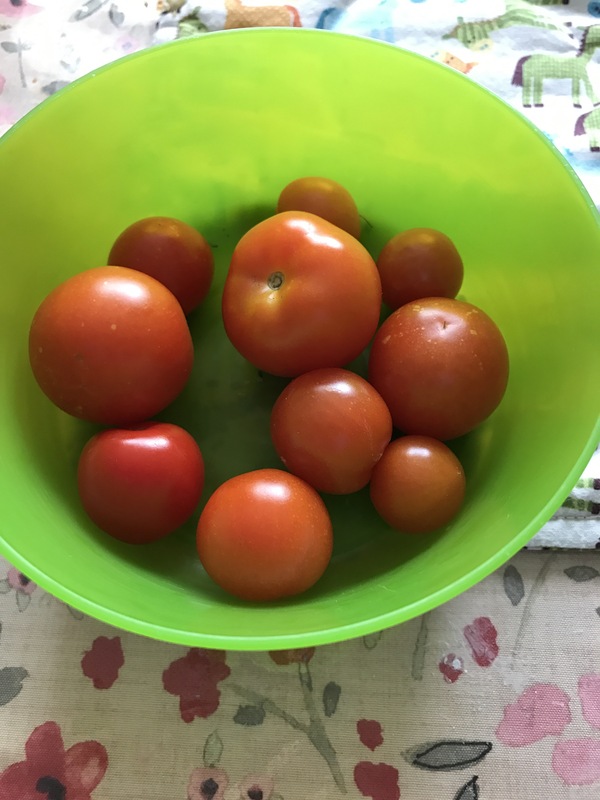 So to ensure that I could actually have a chance to keep and use some of our crop this year I snuck out and picked some yesterday evening and have hidden them in the fridge. Whilst I was there I noticed the new growth on our plants. So the current years stems have brown woody bases and then green growth out the top as pictured below. Then we also now have the new growing stems appearing as shown below. It is these which will end up looking like twigs during winter and it is from these that our next years fruit will grow. The raspberries have started to show their first fruits which means we need to start protecting them from the birds. The last thing we want is all our hard work on them to become bird feed. 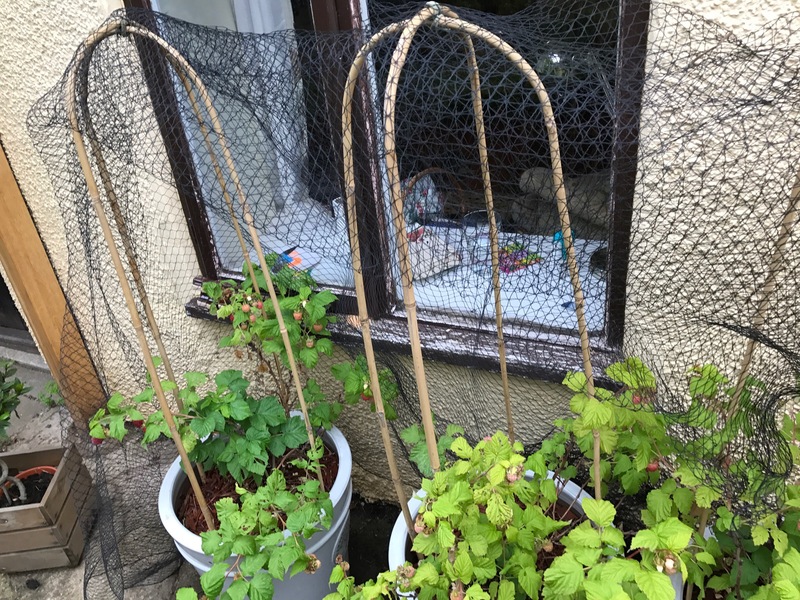 So our raspberries are in pots and as such do not need the support of canes so there is not a natural point for us to attach our netting to. So last week at the garden centre we purchased some bamboo canes and they are now sitting in the pots with netting covering them. The netting has a large enough mesh to ensure that bees can still pass through it but impossible for birds to get through. That is the major downside of soft fruits, the birds love them and netting can be a hassle and tends to look fairly unsightly. 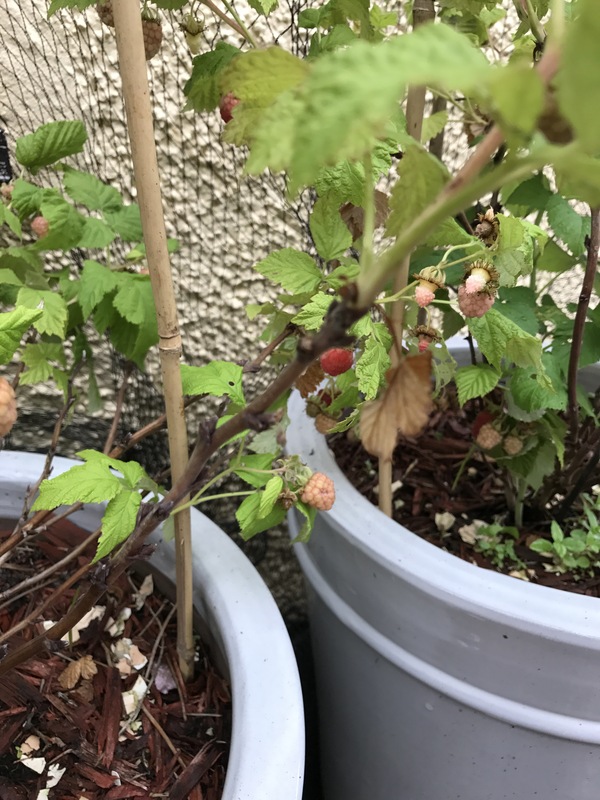 However, as it is only for a short period of time when the plant is fruiting it seems a small sacrifice for what will hopefully be a good crop of fruit. 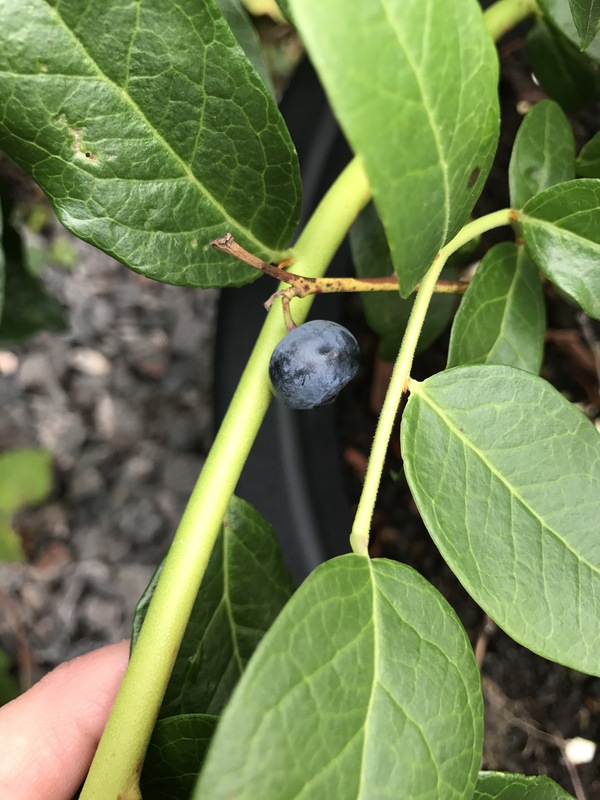 The blueberries don’t seem to be at the point of fruiting quite yet, and are likely to take at least another year to really get going but they will need protection too. 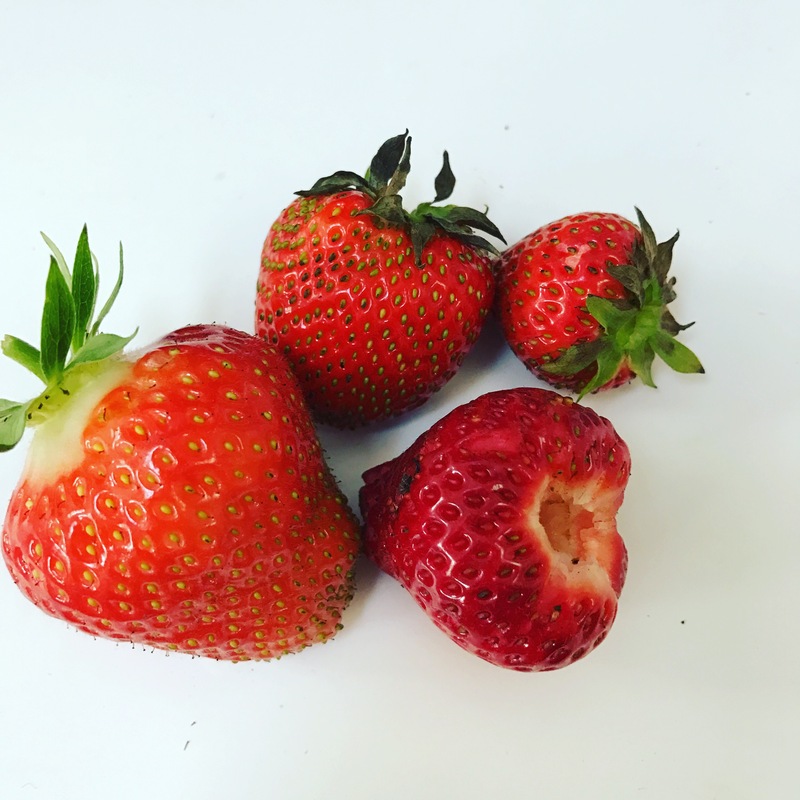 So we have given one of our raised beds over to strawberries and we have had our first harvest. Well, not exactly a full on harvest but we’ve had four strawberries so that is better than nothing. Enough for one each for me and J and two for C. They were so amazingly sweet that I’m now itching for more to ripen. They’re not evenly sized and are a bit grubby but perfect in every way! 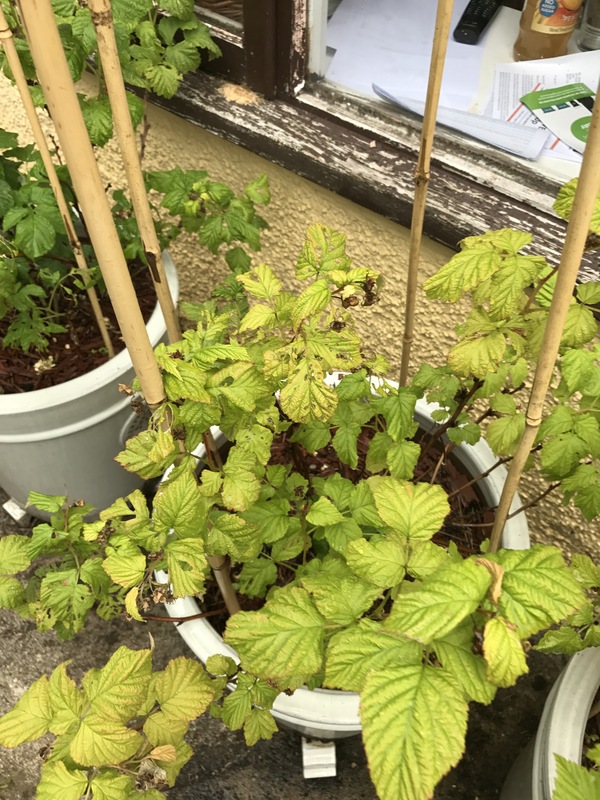 So the raspberries are currently in pots outside of the lounge window just below the window where my chair is. 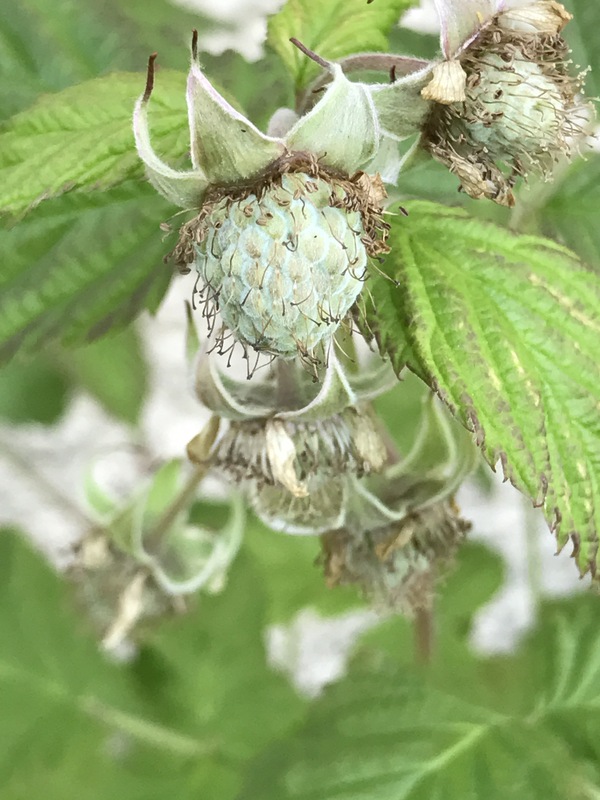 The raspberries have seemed to flourish the past few weeks and we’ve noticed a number of bees pollinating the flowers. It’s a lovely sight to see and I finally managed to get a picture tonight. Fingers crossed this means we will have some lovely raspberries come the summer. 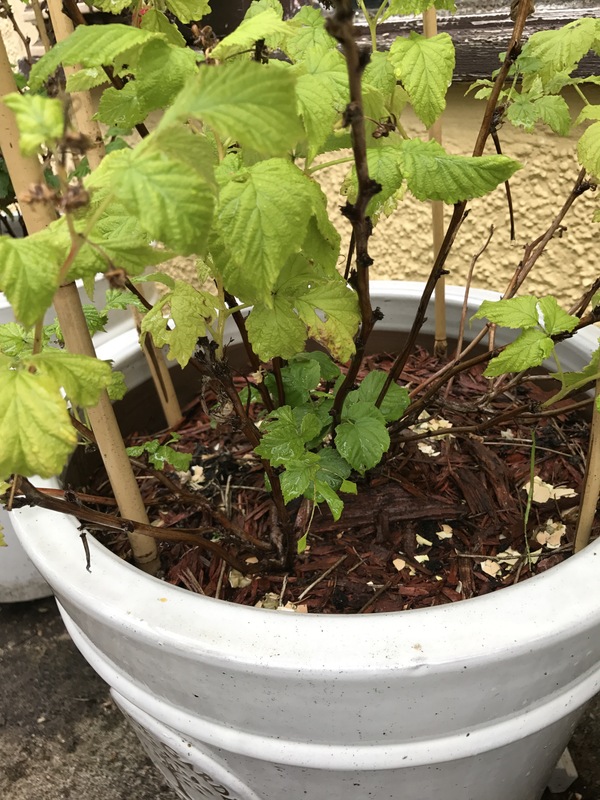 So last year I got three raspberry plants to go in pots. 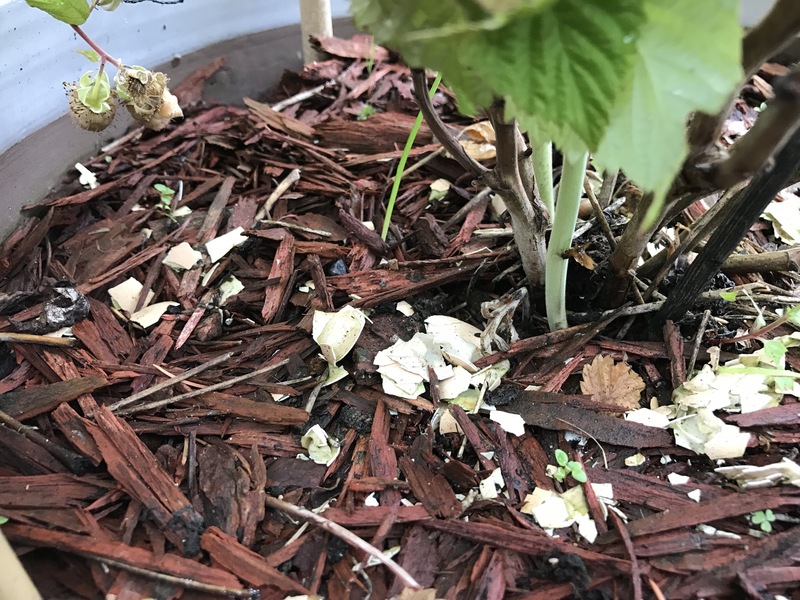 I really wanted to grow fruit in the garden but at the time we were in our old house and looking at moving so it didn’t make sense to plant anything in the ground. 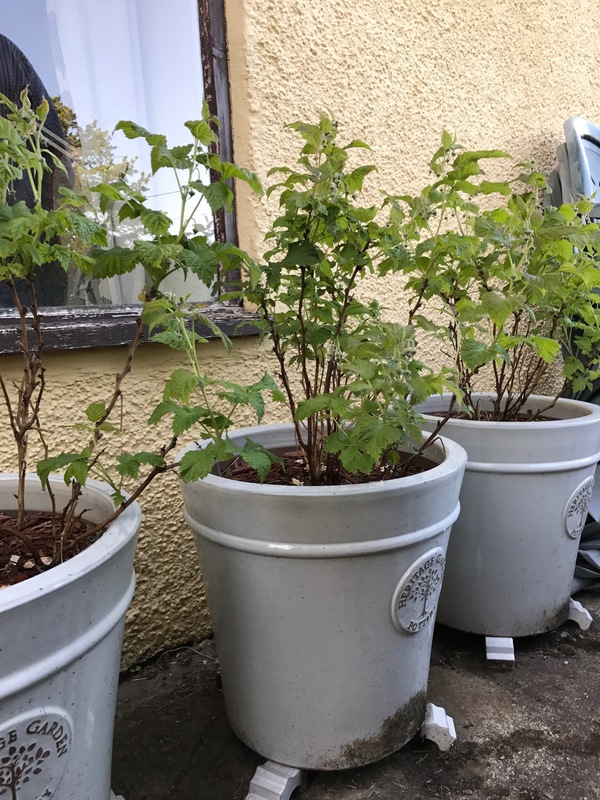 They are a special type of dwarf raspberries which are designed to be grown in pots and as such don’t need canes. For some reason having to tie plants up to canes seems like so much work to me so I’ve always tried to avoid it where possible. I think I’m also concerned about the dangers of having canes sticking up from the ground with a toddler who’s only pace of walking seems to be running! Now the first year they produced some nice folliage but no fruit, which is what we were expecting as the first year is a bit of a preparation year helping the plant to establish a root system and foliage. So from this year we should be expecting fruit, although I can’t remember if they are Summer of Autumn fruiting. I have to admit I’ve been skeptical as over the winter they have just been essentially a bunch of dead twigs. But come the start of spring they have begun to show new growth from the tips of the dead looking twigs and they seem to be thriving. My only dilemma now is how on earth to net them when the fruit starts to appear as the last thing I want is to have the birds steal it. 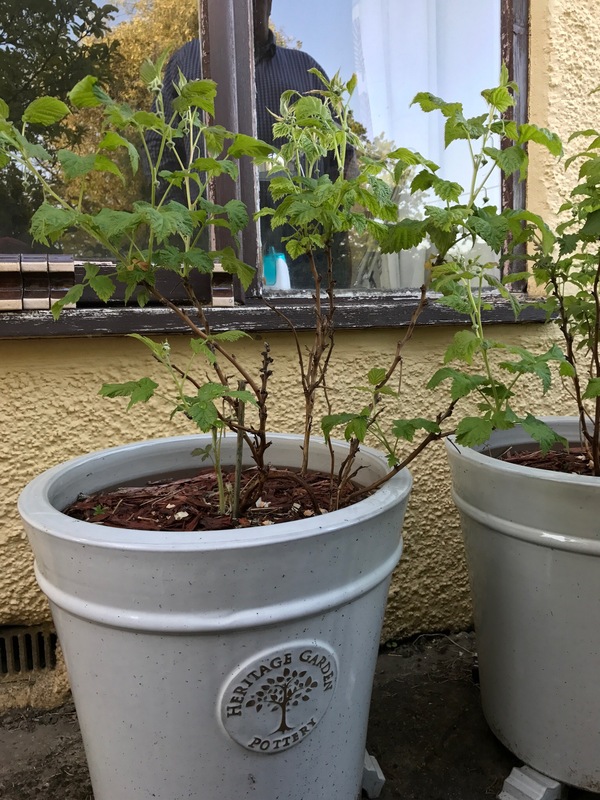 They are currently beneath the windows of the living room in beautiful cream pots although I think long term I will move them as they will end up being quite bushy and could look nice near to the recreation area. Long term I fancy having some Raspberries planted in the ground, although I know that will require the use of canes. Maybe once the big outside works are done then I can find a little patch for them to live. 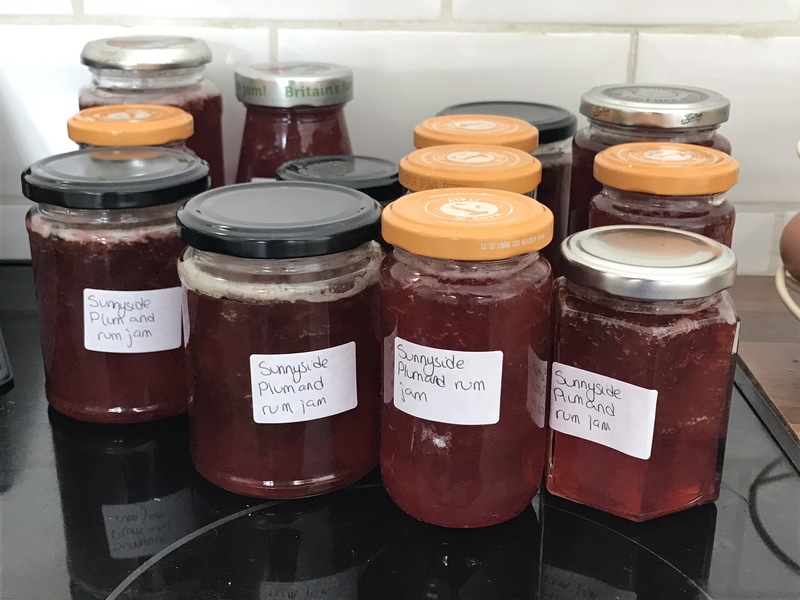 All three of us love eating raspberries and raspberry jam is one of my favourites to make (and one of the easiest to do) so it makes sense for us to have a good supply of them on hand. I think that can be a job for next Spring.